This was our 2nd time at The Andorra which did not disappoint us. It was spotlessly clean and the staff very friendly and helpful. The 2 pools were very inviting and had a life guard on duty. The kitchenette was well equipped and included all that you need. The beds were comfy with lovely soft pillows. The location of the Andorra is perfect. Turn left coming out of the entrance and there is a supermarket across the road. Turn right and that will take you to the bars, restaurants and beach 5-10 mins. A really great place to stay! We have stayed at the Andorra Aparthotel a number of times and are going back again next year. Great location - short walk from bars, restaurants, shops and the large golden beach. There are a couple of supermarkets near the Aparthotel (the larger one up a fairly steep hill, the other just across the road). Rooms- self catering, are spacious and very clean with everything you need. 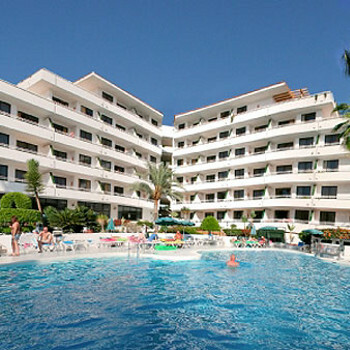 The 2 pools are great with plenty of sunbeds (small cost). The staff are friendly and helpful. Only criticism is that I would not recommend booking B&B - the breakfast is not brilliant, and there are so many great reasonably priced restaurants nearby. Hotel tip: Near the Andorra are a group of bars. Check out The Soul Bar. Also The Restaurant Margarita -really good food. Great music especially by Mikey Mike who works in both places. Having previously stayed close to this Hotel we though we would give it a try and I am pleased to say it was excellent. We stayed in the main block which is classed as 3 star whereas the older part of the complex is 2 star I believe. The Hotel was very clean as was our room which benefited from air conditioning. The pool area was very well maintained with adequate space and unusually had sun beds available all day long, no getting up at dawn to secure a lounger. Reception Staff were very helpful and the maid services was of a high standard, we will definitely use this Hotel again. just returned from a virtual "self build" holiday. Hotel & location are superb. Already planning to return next year- for a longer stay. Although we have visited this area many times it was the first time at the Andorra. We had a one bedroom apartment on the front of the hotel. As it is situated on a main road it could be quite noisy from the traffic but this did not cause us any problems. The hotal and areas were spotlessly clean. The pool areas were also good with plenty of beds available all the time. The hotel also does a lovely buffet breakfast for 4 euros which we found to be good value. The hotel is in a good location for Los Cristianos and Torviscos areas and just around the corner for the local buses which we use quite a lot. I would recommend these apartments for their location and cleanliness. If you do not like traffic noise ask for a room at the back overlooking the pool area. The apartment complex was excellent. Lots of room round 2 lovely big pools, and the apartments were spotlessly clean, and were cleaned every day and very spacious, with big balconies. We were on the street side and never heard a thing at night. The apartments are only 2 minutes walk from lots of cafes, bars and a fantastic selection of designer and discount shops. The apartments are suitable for wheelchair users and the ramps are all sensible with only small inclines, it is flat round about with good kerbs for electric scooters and wheelchairs. The apartments are not adapted but have low baths, and you can hire microwave or toaster and electric kettles for a few euros a week if you have problems cooking. Why I am not going to visit this hotel again? I was living in apartment to the street side. (50 percent of all apartments are to the street side). And the street is very noise even in night time. It doesn't help to close windows: it seems that you are sleeping in a motorway, where trucks, busses and motocycles without dampers are running 24 hours! When I asked to change the room, I wasn't lucky - I didn't get another room ;-(. So, my advise is: If you want to sleep at nights - find a hotel where rooms are not on the street side! We arrived at the Andorra at 2.00am and the guy on reception was a security guard and could hardly speak english, after getting our keys we were taken by another security guard to our apatment's. The security guard had not got a clue where the apartment's where even though he had a map. The apartment's were very clean and plenty of space. The gardens were very well kept and the pool's were clean. There was no entertainment on site although they did have 2 pool tables but no arcade games. There was a pool side bar but it was never open. The rooms were cleaned every day with new towels. Overall it was a very nice complex apart from not having any entertainment. When we got to reception we were made very welcome by a friendly girl who spoke perfect english, she gave us our keys told us in detail how to get to our rooms. as we walked to our rooms we went through some gardens which were very well tended and all the pool area was very clean. every where we looked was spotless. we went to our rooms, very nice, bathroom clean and lounge perfect with direct phone sat tv nice balcony. bedroom spotless plenty of wardrobe space and comfy beds. We had looked around the Andorra the previous year to going, when we met a couple on holiday. We were so impressed that we the next year we booked directly with the hotel and arranged the flights ourselves. We weren't disappointed. Our room was great with a huge corner terrace that had the sun all day and great views. The pool area was very clean and tidy and the little poolside bar was a godsend. The pool area itself is a suntrap, but there are plenty of umbrellas if it gets too much. The staff were helpful at all times from the moment we arrived to the minute we left, including the maids who always said hello. Although there isn't any entertainment on at the Andorra, the inside bar and lounge are very nice and we had a great laugh with the barmaid who worked most nights, as well as the good looking guy who ran the pool bar! We had breakfast quite a few times there, which was always good and we also had a few meals when we wanted to eat before 6 pm. The steaks were good, as were most things. We would definitely recommend the Andorra to anyone and we are going again this year for our honeymoon. We have requested the same room again and really can't wait to get there! 10 out of 10.